For a copy of the full report visit here. After the Saudi bombing of a Yemeni school bus on August 9, 2018 that killed 44 children, CNN revealed that the bomb used in the attack was manufactured by Lockheed Martin. 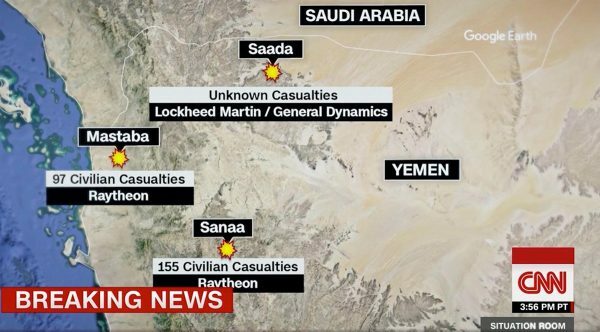 It showed a map of Yemen pinpointing several other attacks where large numbers of civilians have been killed by bombs from not only Lockheed Martin, but also General Dynamics and Raytheon. It is a rare moment when a mainstream US media outlet makes the connection between U.S. weapons manufacturers and the killing of civilians. But tragically, it is not rare at all that repressive regimes kill and maim civilians with American weapons. This report focuses on the five largest U.S. arms manufacturers—Lockheed Martin, Boeing, Raytheon, Northrop Grumman and General Dynamics—and their dealings with three repressive nations: Saudi Arabia, Israel and Egypt. The absolute monarchy of Saudi Arabia is using weapons to repress internal dissent and to bomb Yemen into a humanitarian crisis that has spread death, cholera and famine. Israel has used American weapons for decades to maintain a 50-year-long hostile military occupation of Palestine and to turn Gaza into a 21st century version of the Warsaw Ghetto, policed with bombs, missiles, F-16s, Apache helicopters and snipers. The Egyptian military used its American weapons to overthrow the fragile, fledgling democracy that the Egyptian people won in the Arab Spring in 2011, and then to massacre between 1,000 and 2,600 Egyptians in Cairo’s Rabaa Square, the deadliest massacre of peaceful protesters anywhere since China’s massacre in Tiananmen Square in 1989. In this report, we document the complicity of the U.S. arms industry in civilian massacres, war crimes and human rights abuses in each of these countries. This is not a case of selling weapons in peacetime that are later implicated in isolated incidents that kill civilians or strike civilian targets. These companies, like the U.S. government itself, collaborate actively with these governments and military forces as they kill regularly civilians and commit other war crimes. Neither the companies nor the U.S. government, which is an active partner in foreign weapons sales, accept responsibility for how these weapons are used. It is a moral outrage that the leaders of these companies and their stockholders continue to amass fortunes from selling products that, when used for their intended purposes, kill, maim and displace millions of people. If U.S. leaders or their Saudi, Israeli and Egyptian allies are ever held criminally accountable for war crimes, these executives deserve to stand in the dock with them, like German weapons maker Alfried Krupp, who was sentenced to 12 years in prison and stripped of his wealth by the Nuremberg war crimes tribunal. The weapons manufacturers, who Pope Francis refers to as “merchants of death,” rely on a catastrophic business model that feeds on chaos, political instability, human rights violations, disregard for international law, and the triumph of militarism and brinkmanship over diplomacy. Over 50 years ago, President Eisenhower warned that “an alert and knowledgeable citizenry” was needed to rein in the military-industrial complex. The world is still waiting for U.S. citizens to wake up and put an end to this insidious marriage between war and commerce.